Home of Dartmoor National Park and miles of incredible coastline, Devon’s beauty is enough to draw visitors back year after year. Food and culture adorn the English Riviera, between Torquay, Paignton and Brixham, with centuries’ worth of maritime history to explore. One visit is never enough so owning a luxury lodge here is a great way to catch everything. 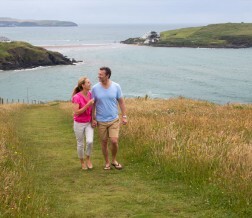 Enjoy stunning views of the iconic Burgh Island, a favourite of writing legend Agatha Christie, direct from your very own lodge at Challaborough.